We embroider / print on textiles from one piece, no minimum quantity! The following prices are only indicative, because the price can vary depending on size / design / number. Our courses are targeted at private consumers and businesses. The following prices are exclusive VAT. For more information, see the table and beyond the table! 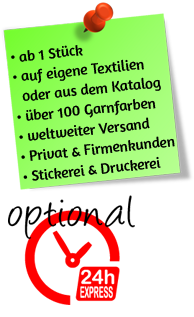 For embroidery a mechanical template must be created which has to be paid only one time; for a logo the price for the template is 25,- EUR excl. VAT for normal text 15,- EUR excl. VAT.